Here at Toni&Guy Newmarket we pride ourselves on a friendly and professional service throughout your salon experience. We opened the salon in the town centre in 2005 making it easily accessible to clients living in the town and surrounding areas. Our strong team of passionate stylists and technicians have been working hard in the industry for over a decade. During this time they have gained recognition within the company and provide a service that reflects this. 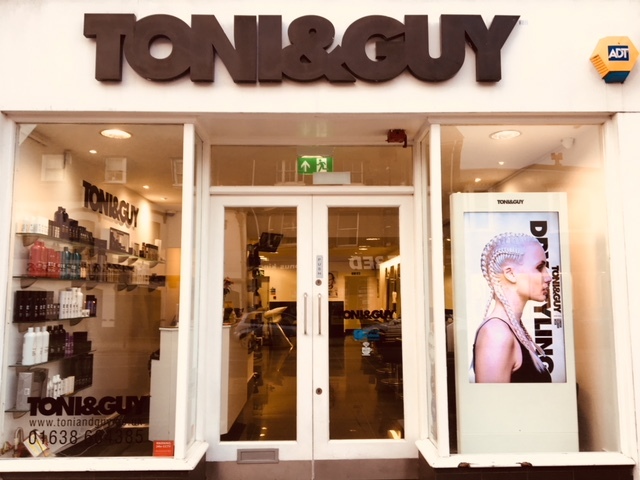 At Toni&Guy Newmarket we have a strong work ethic and comfortable salon feel which will give clients exceptional results and a relaxed experience. All of our team are willing to help and advise be it with new colour, styling or find the right product to help you recreate your salon style. We will ensure that your visit to Toni&Guy is ultimate experience for you and your hair. Thank you for taking the time to leave a review, we are glad you had a great experience and we look forward to seeing you again soon. Honestly, Georgia is just the best stylist I have ever had. And the whole team at Newmarket are just excellent. Even the word "perfect" is an understatement for this salon. Thank you for taking the time to leave a review, we are glad you had a great experience with Georgia and we look forward to seeing you again soon. It was my first ever time at Toni and guy and I felt very at ease. Chantelle was very courteous and knowledgeable. It was a really great experience! My first visit to the Newmarket Toni & Guy. Had Chantelle as stylist. Excellent through and through. Would definitely recommend! Thank you Chantelle,for my lovely colour and condition. Thank you for taking the time to leave a review, we are glad you had a great experience with Chantelle, we look forward to seeing you again soon. Thank you Chantelle for your expertise this morning. I love the colour and condition of my hair. Thank you for your 5* review, we are glad you had a great experience with Georgia, we look forward to seeing you on your next appointment. Thank you for your 5* review, we are glad you had a great experience, we look forward to seeing you again soon. We had ***** for Kerrie’s hair but could not select. Not very happy with colour. Paid more than was agreed before the Appt. Double charged for conditioner but was paid back overpayment when we returned. Will not be returning. Faith is an angel and a great hairdresser. She's a lovely bubbly warm person. I look forward to going back. Thank you for taking the time to leave a review, we are glad you had a great experience we look forward to seeing you again soon. First time at this salon. Really pleased with my hair. Georgia was relaxed & friendly, very easy to talk to. Thank you for your kind words! we are glad you had a great experience with Georgia. We look forward to seeing you again soon. Georgia cuts my hair so well, I receive multiple compliments every time! She is also very likeable & sensible to talk to. Thank you for your kind review, we are glad you always have a great experience with Georgia, we look forward to seeing you again soon. And I mortified and angry that such a mistake could possibly be considered a fluke. Day 1 all the staff were eating and non existing, today, Day 2 only me and offered coffee with a chipped sugar container, does not cut the mustard. Equally over half an inch had to be removed from my hair. Totally, absolutely disgusted. I cannot tolerate looking at the mess my hair is. I also have photographic evidence. So wrong and so distressing. Never ever will I recommend Toni and Guy. DISGUSTED kids pretending waltzing around in gowns and not a bloody clue about customer service. Thank you for taking the time to leave a review, it was lovely to speak to you, thank you for your feedback we are looking forward to seeing you again on Saturday. Great cut - but customer service needs to be better. I loved my haircut and Chantelle was very professional and I would definitely go again. However, customer service needs a bit of sparkle and professionalism overall. Thank you for taking the time to leave a review, we are glad you loved your hair and will be back again soon! thank you for your comments which we will take on board! we look forward to seeing you again soon! Georgia was a lovely stylist, she listened to what I wanted, gave me ideas of her own and took time to show me how to style my hair at home. She is a credit to Toni & Guy and I will be returning to see her. Thank you for taking the time to leave a great review! We are so glad to hear about your positive experience here with us. We will pass all your lovely comments onto Georgia for you. Toni and Guy Newmarket team. Good efficient service, friendly and nice and polite. Excellent colorist, nice to talk to. We are so pleased to hear about your experience here with us. Not sure about the colour,the condition of my hair is good but the colour is not blonde. It's a lot darker than l wanted. I should have said but didn't want yo make a fuss. I guess it will fade in time. Brilliant as ever, Georgia always gets the result I ask for and actually prepares me for the result I’m going to get and never doesn’t tell me what to expect! Thank you for taking the time to leave a brilliant review. We are very pleased to hear about your experience with Georgia and glad you left the salon feeling satisfied. Excellent haircut and great staff and service. Good atmosphere and love the salon. Thank you for taking the time to leave a excellent review! We are so glad to hear about your positive experience.